There was a heavy police presence at SPASH today, part of a training scenario for K-9 units from across the state. Sheriff Mike Lukas said a wide network of counties, including Portage, work together regularly for training events in larger buildings. Dogs need to regularly train in both empty buildings and structures filled with people, he said, so they are prepared for changing circumstances on the job. On April 9, the training took place at the public high school, where dogs trained by searching for drugs while students were in their morning classes. It was not immediately clear if the training search yielded any results. 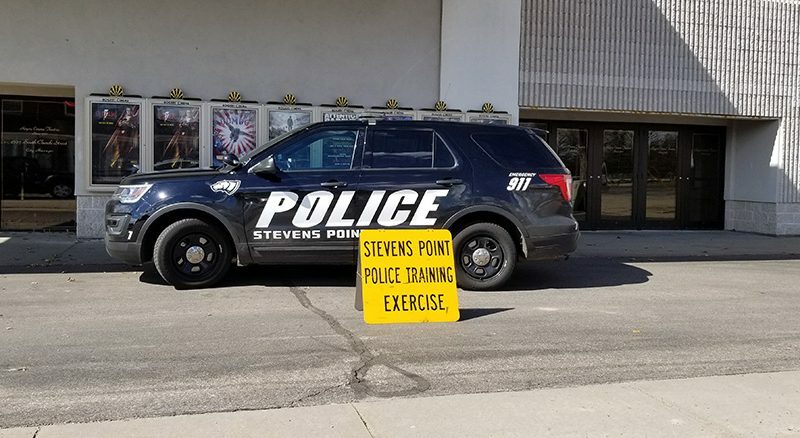 Across the city, the Stevens Point Special Response Team—also referred to as SWAT (Special Weapons And Tactics)—was training inside a local movie theater. The SRT team practiced a number of scenarios inside Rogers Cinema 7 throughout the day, according to Assistant Police Chief Tom Zenner. Zenner added for the safety of the public and officers, training events are typically not announced to the public in advance. “When you’re training on tactics, you really don’t want an audience,” Zenner said. A large-scale, joint training event involving local fire and law enforcement agencies, UWSP, and other groups is being planned in the summer.